America was built upon the idea of freedom for all who wanted to live free from oppression and excel in opportunities. We the people have become the envy of the world. While opportunities are highlighted it is clear that people with evil intentions have utilized our system to do harm. For now, while we seek to preserve freedom for our posterity one of the best things we can do is to continue to educate ourselves and whomever we can to pass the torch only to further our cause. People who cherish freedom must act to keep, promote and maintain otherwise fading gifts of freedom-lovers before us. May I remind you of Abraham Lincoln's phrase: "Government of the people, by the people and for the people" was stated and intended to emphasize people over the government? Even the best advertisers I've encountered seem not to know how Lincoln's oral tone stressed the word "people". In my many posts on Twitter and Facebook, the word PEOPLE is capitalized for one purpose...to highlight and perpetuate Lincoln's use of the word in His brief celebrated, "Gettysburg Address". A little-known inquiry and study traced all the way back to a person who heard Lincoln's speech concluded that the endearing word "people" was far more important than the government. This helps explain the purpose of the 2nd amendment to the Constitution of the United States. Books are arsenals in our quest for prosperity. 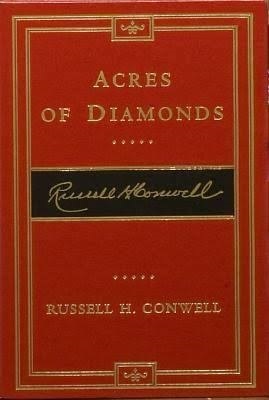 One stands out as a favorite for all aspirants to the "American Dream" of betterment for humanity: Acres of Diamonds. The author, Russell Herman Conwell built Temple University through the power of over 6000 speeches in which he included the story of a farmer who seeking diamonds eventually committed suicide in a fit of despondency. Another farmer had purchased the plot and discovered a large stone which happened to be only a sampling of what became the largest diamond mine ever discovered. The moral of the story is that we the people in our great land can find our own fortune whether tangible or intangible within ourselves if we'll only persist and stay focused on making our greatest contribution in service to others. See the story on my Facebook page today, January 17, 2019.